The word baccarat is derived from the Italian baccara, which means zero. The term refers to the fache game cards and 10s, all of which have zero value in the game of baccarat. In Europe, baccarat and a similar version called chemin de fer are among the most popular casino games. Since baccarat's introduction in Nevada casinos, the game has assumed an aura of glamor. In most casinos, baccarat is played in a roped-off area. The intention was to attract the high roller, or the more sophisticated monied player. With the tuxedo-clad dealers, there is an air of elegance to the game. However, for all the enchantment, baccarat is primarily a simple game. There are no decisions or options; no degree of skill is required for either player or dealer. Players may sit in any open seat at the table, seating position does not affect the play in any manner. Each seat corresponds to a number on the layout, one through 15. Three dealers service each table. The dealer standing between positions one and 15 is known as the "caller." He runs the game as cards are dealt from the shoe. Each player gets a turn to handle the shoe. The player must bet the bank when he has the shoe, but any player may decline the shoe and it passes right along from player to player. Again, there is no advantage or disadvantage in dealing the cards, it is merely a formality and part of the the ambience that players enjoy. The caller receives the cards from the player with the shoe, places them in the appropriate boxes and then calls for another card or declares the winner, according to the rigid rules of the game. Players bet by placing their chips in the numbered box opposite their seat. Bets may be made on the player or bank, and both are paid off at even money. In most games. bets range from a $20 minimum to $2,000 maximum. After the winner is announced. The two other dealers at the table pay off the winning bets and collect from the losers. If the bank was the winner, players who won must pay a 5% commission on their winnings. Thus, if a player had a $100 bet on the bank and it won, $5 would be owed to the house. Rather than collecting this vigorish after each game, a record of what is owed by each player is kept in a numbered box just opposite where the two payoff dealers sit. Player pay the accumulated amount after the finish of a shoe. Each time the shoe is depleted of cards, all eight decks are thoroughly shuffled and replaced in the shoe. All cards, ace through 9, are valued according to their count. Tens and face cards count as zero. Thus, if the first two cards dealt are a king and a 4, the count is four. And 8 and 6, although totaling 14 would count as four after subtracting the 10. When any two card total over a 10 count, 10 must be subtracted. The remaining total is the card count. These rules apply in all American casinos. Printed copies of these are available wherever baccarat is played. Dealers act according to these rules without consulting players at the table. The rules are automatic. The highest total any baccarat hand can have is nine. 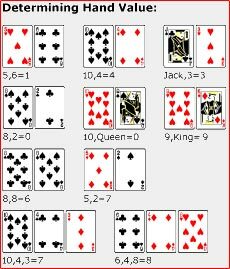 A two-card total of nine is called a "natural" and cannot lose. An eight is the second-best hand and is also called a natural.. 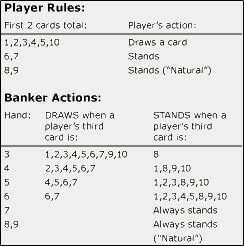 If both player and bank are dealt identical hands, it is a standoff (a tie) and neither bank nor player wins. No further cards can be drawn to a two-card draw of six or 7. When holding other two-card totals, player and bank draw another card at the direction of the caller. In studying the accompanying chart, one can easily determine the rules of the game. It is a matter of letting the dealer do the calling, and declaring the outcome. Players are concerned only with how much they wager on each hand and whether they bet on the player's side or the banker's. The house edge in baccarat is the lowest of any casino game. With only a 5% commission on winning bank bets and nothing taken from winning player bets, the player's disadvantage is only 1.37%. In some casinos, ties are permitted to be bet on. The payoff is 8 to 1. It is a bad bet for the player as the house edge is 14.1%. A number of casinos have installed smaller baccarat tables, usually among the blackjack tables. It is the same game but the rituals of passing the shoe, etc., are missing and the game is staffed by only one dealer. The layout, however, conforms to the regular baccarat table and each seat position (one through six) corresponds to a number and betting box. Limits are usually from a $2 to $5 minimum up to $500 maximum. Mini-baccarat is played fast but the exact same rules apply as in the larger game.